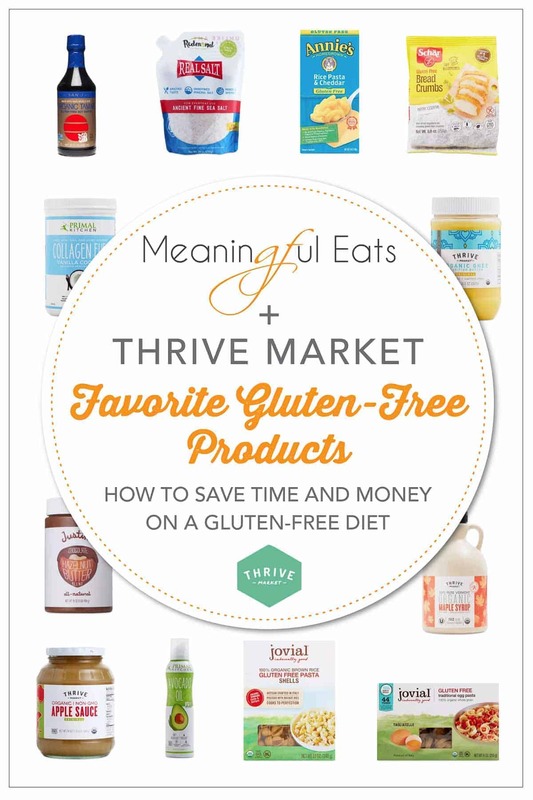 Thrive Market is BEST place to save money on your favorite gluten-free, natural and organic products! 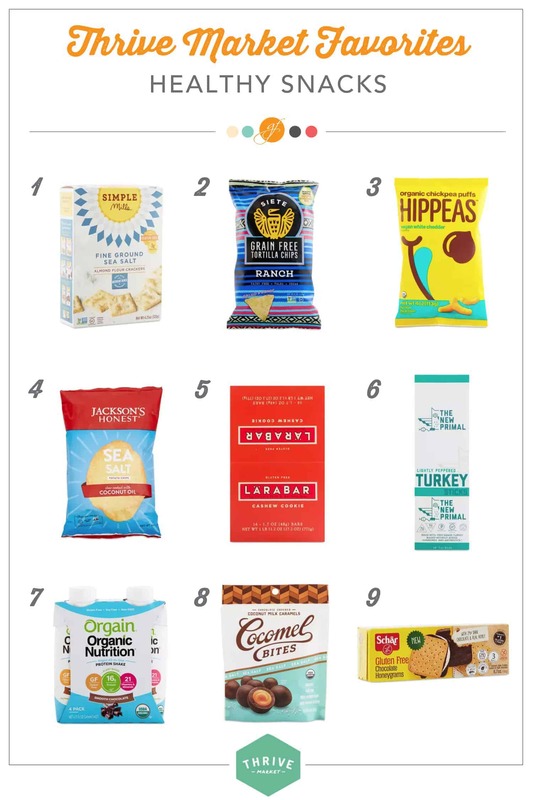 In this honest review of Thrive Market, I share why I love Thrive Market and a shopping list of the pantry staples, gluten-free baking supplies and healthy snacks I buy over and over again. It’s no secret that following a gluten-free diet can get expensive. 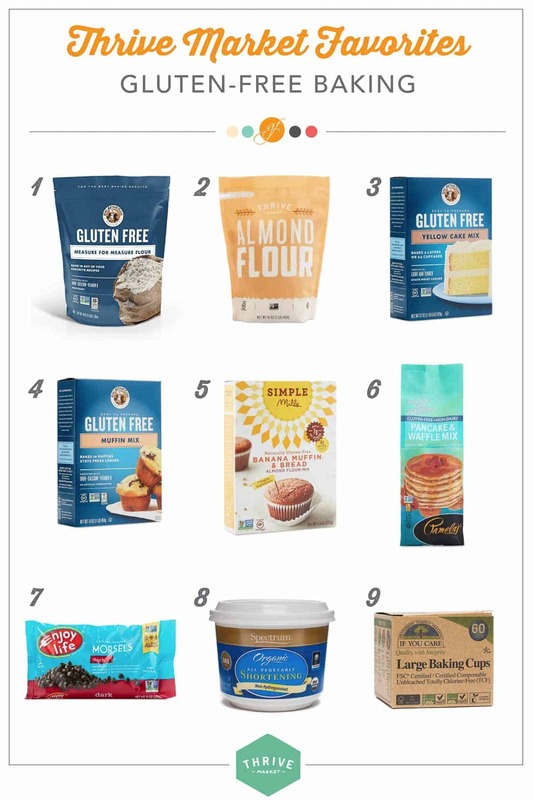 I’m always looking for ways to save money on gluten-free products which is why I’m so excited to share my love for Thrive Market. I’ve been using Thrive Market for well over a year now and I don’t know how I ever lived without it! If you’re wondering what it is – think of Costco with wholesale prices but on all the best gluten-free, organic and healthy products. Plus Thrive delivers right to your door (free shipping for orders over $49 all the time) helping you save time and the effort of tracking down all your favorite gluten-free products. Thrive Market carries many gluten-free products that I can’t find locally. And even for the products I can find locally, Thrive has the best prices around! The way Thrive works is similar to Costco. You purchase an annual membership, then you’re able to get wholesale pricing on the products. If you’re still on the fence about it you can try Thrive FREE for 1 month to see if you like it. You can get 25% off your first purchase + 30 day free trial membership here! 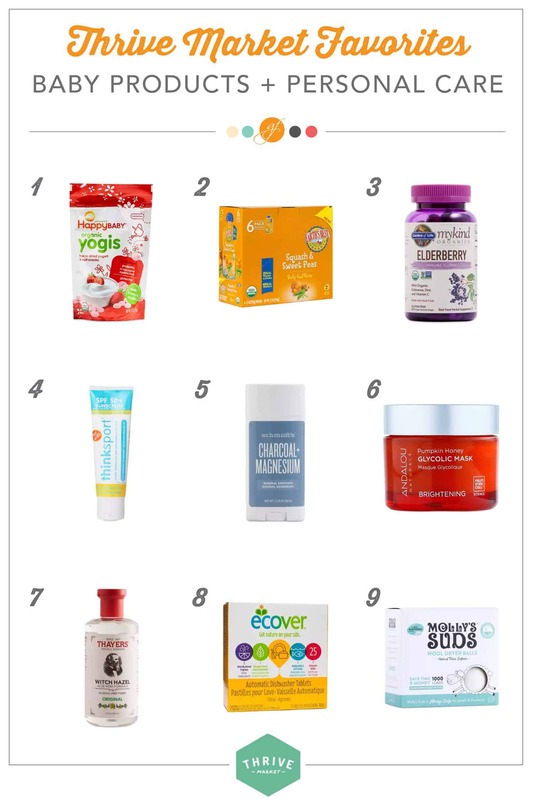 Here is a round-up of my favorite products to buy on Thrive Market! 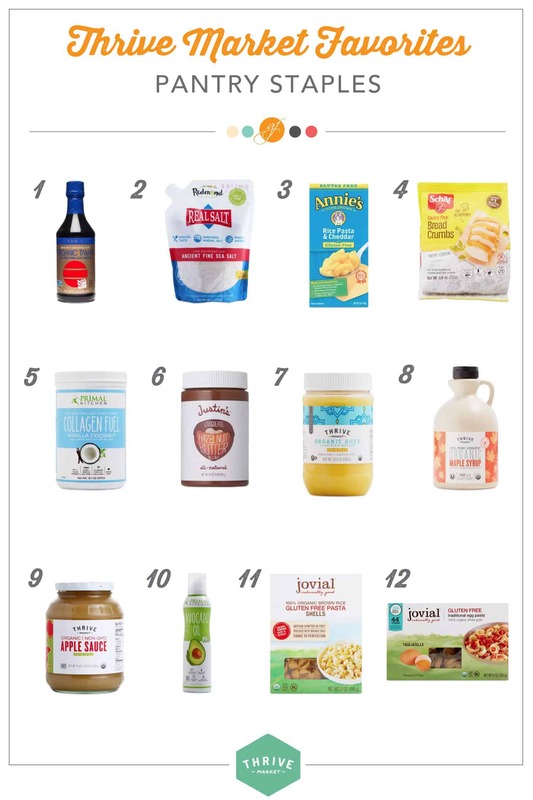 I’ve included pantry staples, baking supplies, healthy snacks and baby + personal care. These are the products I buy over and over again! 1. Gluten-Free Soy Sauce – Every gluten-free pantry needs a bottle of gluten-free soy sauce (also called tamari). Most soy sauce contains a blend of wheat and soy. Tamari is made from 100% soy. You can convert so many recipes to gluten-free just by using gluten-free soy sauce in place of regular soy sauce. 2. Redmond Real Sea Salt – This is my go-to salt! I love that it’s full of minerals and less refined than other salts. It also has a nice fine texture for baking and cooking. I can’t always find this salt at my local grocery store so buying it on Thrive Market is perfect. 3. Gluten-Free Mac and Cheese – My kids love the occasional box of gluten-free mac and cheese for lunch. Thrive Market has the best price for it of anywhere I’ve seen! I always add 2-3 boxes to my order to keep on hand. 4. Schar Bread Crumbs – I always keep gluten-free bread crumbs around for coating meat, topping homemade mac and cheese (or homemade spaetzle) and sprinkling over roasted brussel sprouts (try it!). I love ordering these Schar Bread crumbs from Thrive so I don’t have to track them down at my local store. 5. Primal Kitchen Vanilla Collagen Protein Powder – I always opt for collagen-based protein powders because they are dairy-free and easy on my stomach. Primal Kitchen makes my favorite collagen protein powder. I buy the vanilla flavor because it’s so versatile. I add my own cocoa powder if I feel like chocolate! 6. Justin’s Chocolate Hazelnut Butter – A healthier and more delicious chocolate hazelnut spread! One of my go-to breakfasts is a frozen waffle (try these buckwheat waffles!) toasted and spread with this Justin’s butter. I also use it on toast or as a filling for crepes. 7. Organic Ghee – Thrive Market has the BEST prices for ghee! I use ghee all the time and this one has a nice flavor and texture. 8. Maple Syrup – We are syrup snobs over here and only like the real kind! Thrive has great prices on staples like this to make them more affordable. 9. Organic Applesauce – I use applesauce often in my gluten-free baking. We make these Gluten-Free Pancakes once a week and applesauce is the secret ingredient. I like that this one is no sugar added and organic. My kids also like “cold applesauce” out of the fridge with cinnamon as a snack. 10. Primal Kitchen Avocado Oil Spray – This spray is so versatile and healthier than canola oil varieties. 11. Jovial Foods Pasta – Jovial Foods Pasta is my FAVORITE kind of gluten-free pasta. I always stock up on it. I love that Thrive carries all the shapes and varieties they don’t sell at my local grocery store. 12. Jovial Foods Tagliatelle – Speaking of Jovial – these egg noodles are amazing! They are perfect for serving with beef stroganoff. Get 25% off your first purchase + 30 day free trial membership here! 1. King Arthur Flour Measure-for-Measure Baking Flour – This is my go-to gluten-free 1:1 flour for baking! I use it in so many recipes including my BEST EVER gluten-free chocolate chip cookies, gluten-free banana bread, gluten-free carrot cake and more. I love the consistency of this flour and the results I get in my baked goods. 2. Almond Flour – Adding a little bit of almond flour to baked goods is one of my best gluten-free baking secrets. It helps with browning, flavor and texture. (Also try these highly-reviewed Almond Flour Chocolate Chip Cookies) Thrive Market has a great price for almond flour! 3. King Arthur Flour Yellow Cake Mix – This is my go-to cake mix for birthday cakes and cupcakes. It’s light, fluffy and easy-to-make! 4. King Arthur Flour Muffin Mix – My kids love these muffins! You can add whatever mix-ins you like. We usually do half with wild frozen blueberries and half with mini chocolate chips. 5. Simple Mills Baking Mixes – Simple Mills makes excellent mixes if you’re looking for a grain-free, lower sugar option. I always add a mix to my cart on each Thrive order. 6. 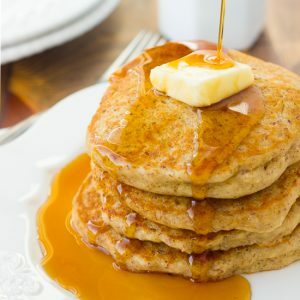 Pamela’s Pancake and Waffle Mix – My husband loves to make breakfast for us on the weekends but doesn’t love complicated gluten-free recipes. 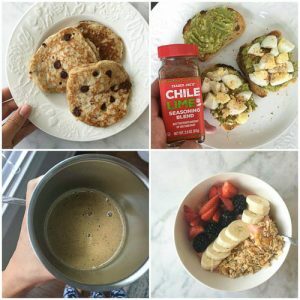 We like this mix to make waffles! It’s easy and delicious! 7. Enjoy Life Foods Chocolate Chips– These chocolate chips are a staple at my house. I use them for everything! I love that they are totally dairy, gluten and allergy-friendly. 8. Organic Palm Shortening – This sustainably sourced palm shortening is great in recipes like my gluten-free banana bread and almond flour snickerdoodles. 9. Unbleached Baking Cups – These baking cups are one of my favorite baking products! Nothing sticks to them and they make all the difference when baking gluten-free cupcakes and muffins. 1. Simple Mills Crackers – I can’t be trusted with a box of these crackers! They are truly delicious. Thrive Market sells them for a better price than other retailers. 2. Siete Foods Chips – If you’re avoiding corn or grains you have to give these chips a try. I love Siete products and that they’re easily available on Thrive. 3. Hippeas Vegan White Cheddar Puffs – Where my cheese puff lovers at? These Vegan White Cheddar Puffs are one of my favorite movie watching snacks. I love that they’re dairy-free! 4. Jacksons Honest Potato Chips – Jacksons makes their chips with healthier oils like coconut oil. They are also so delicious! 5. 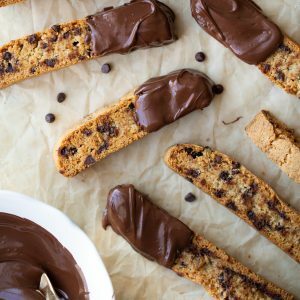 Lara Bars – We always have Lara Bars at our house for healthy snacks. Thrive Market carries all the flavors I love at great prices. 6. The New Primal Meat Sticks – My son has one of these meat sticks in his packed lunch every single day! My husband and I also like to snack on them. Lately I’ve been love this Lightly Peppered Turkey flavor. 7. Orgain Vegan Chocolate Protein Shakes – I always have these vegan protein shakes on hand for busy mornings. They are they perfect thing to grab on-the-go. 8. Cocomels Coconut Milk Caramels – Dairy-free caramels – yes please! These are maybe not the healthiest snack – but they are a great little treat! 9. Schar Gluten-Free Chocolate Honeygrams – I add a box of these chocolate covered honeygrams to every order I place on Thrive. They are my favorite treat when I want something sweet but not too sugary. 1. Freeze-Dried Yogurt Snacks – My baby loves these – but they can be pricy! They are even cheaper at Thrive Market than they are at Target. 2. Organic Baby Food Pouches – Thrive Market also carries a variety of baby squeeze pouches. You can’t beat the convenience of these when you’re on-the-go! 3. Elderberry Gummies – I give these to my kids daily when it’s cold/flu season. They love the taste and always want them with their vitamins. 4. Thinksport Kids Sunscreen – 2 years ago when I was pregnant with my daughter, I decided it was time to clean up my family’s sunscreen routine. I’ve tried a few natural sunscreens and this is my favorite. 5. Schmidts Natural Deodorant – I’ve tried a lot of “natural” deodorants over the years and haven’t loved any until I found this one! It’s aluminum-free and works great even in hot/humid southern summers. 6. Pumpkin Honey Glycolic Mask– This face mask smells like a creamy pumpkin dream! I use this brigthening mask in my skincare routine 1-2 times a week. 7. Thayers Witch Hazel Toner – You can’t be this basic witch hazel toner. I use it nightly and it’s a very affordable natural beauty product. 8. Ecover Dishwasher Tablets – These are my go-to dishwasher tablets. They work great and don’t leave a residue. I also like that they don’t have an overpowering smell. 9. Molly Suds Wool Dryer Balls – If you haven’t tried dryer balls yet they will change your life! I love these ones from Molly Suds. Is Thrive Market Worth It? If you ask me if Thrive Market is worth it my answer is a resounding YES! I save hundreds of dollars every year by ordering with Thrive. I love the prices, wide selection of products and convenience of Thrive Market. Whether you follow a gluten-free diet or you just want to feed your family with cleaner products, Thrive Market will save you time and money. Give it a try yourself! Sign up here for 25% off your first purchase + 30 day free trial membership here! Disclaimer: This post includes affiliate links, and I will earn a commission if you purchase through these links. I recommend Thrive Market because I genuinely love it and use it for my family! I highly recommend Thrive and these products and think it will save your family time and money too. Thanks for reading!